Abstract. 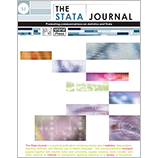 The SPost user package (Long and Freese, 2006, Regression Models for Categorical Dependent Variables Using Stata [Stata Press]) is a suite of postestimation commands to compute additional tests and effects representations for a variety of regression models. To facilitate and automate the task of tabulating results from SPost commands for inclusion in reports, publications, and presentations, we introduce tools to integrate SPost with the estout user package (Jann, 2005, Stata Journal 5: 288–308; 2007, Stata Journal 7: 227–244). The estadd command can retrieve results computed by the SPost commands brant, fitstat, listcoef, mlogtest, prchange, prvalue, and asprvalue. These results can then be tabulated by esttab or estout.